Many of us have come to know the greatness of Gouda after its signature bright red wax caught our eye and lured us in one day in the cheese aisle. Gouda is familiar and one of the most popular Dutch cheeses, so Gouda may not be considered the most exotic—but it is far from ordinary. Gouda is distinct in character and diverse in style—embodying versatility. It presents itself in so many different ways: young and mild, smoked and hearty, or aged into a state of sweet funkiness. Gouda is like the chameleon of cheese. Gouda is one of the best cheeses for smoking, to which there are many methods, and so Gouda’s flavor profile can vary widely in that respect. Gouda can also spend anywhere from a mere four weeks to years maturing, resulting in vastly different textures and flavors. In its youth, Gouda is mild, soft, and creamy and then evolves into a stronger, harder, crumblier cheese as it ages. Gouda ages incredibly gracefully. No matter how old, you’re Gouda love it. Where does Reny Picot Gouda fall on the scale? At Old Europe Cheese, we handcraft two different types of Gouda. Our original Reny Picot Gouda is young, aged for 60 days, so it is creamy and mild. But there are several other elements that make Reny Picot Gouda so exceptional. What tops the list is perhaps the development of dichotomous flavors. It is sweet and savory, a harmonious and unexpected balance of salt and sugar—like salted crème caramel. Then, there’s our Reny Picot Smoked Gouda. Buttery and salty with a caramel undertone, Reny Picot Smoked Gouda is young and has a smokiness that is pronounced, but not overwhelming. At Old Europe Cheese, our Gouda is hickory cold smoked in the traditional Dutch farmhouse manner, in which a fire is lit and burns voraciously until the smoke house is filled with smoke, at which time the fire is allowed to go out. Then, wheels of Gouda are placed in the house and cold smoked for over 16 hours. This process is unique, as most cheesemakers use a hot smoke, which means the cheese is, in effect, cooked twice. This can cause the cheese to dry out and take on an unpleasant leathery texture. Instead, our cold smoking process ensures you will sink your teeth into a perfectly smoked cheese with a texture and density that immediately softens and become creamy. Yes, Reny Picot Gouda literally melts in your mouth. Now that you’re ready to explore each and every bit of greatness of Reny Picot Gouda, find it in a store near you. 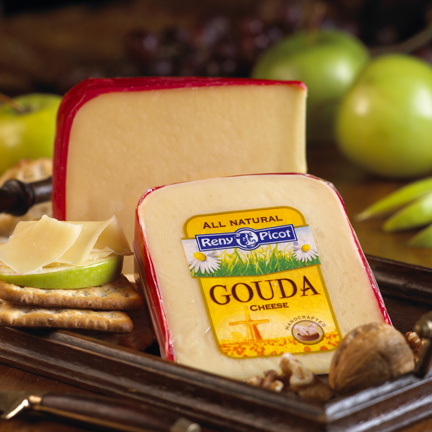 Also, if you have a favorite Gouda recipe, let us know! Contact us today to share a recipe or if you have any questions for us here at Old Europe Cheese. We’d love to hear from you!